Health security is dependent on many factors such as: individual government policies and regulations; budgets; management systems; and the collection, analysis, use, and protection of data. Telemedicine has the potential to change how healthcare is delivered around the world, and has developed to the point where it is possible for its use to become commonplace. The questions are, however, whether and how the use of telemedicine will improve health security in Southeast Europe. 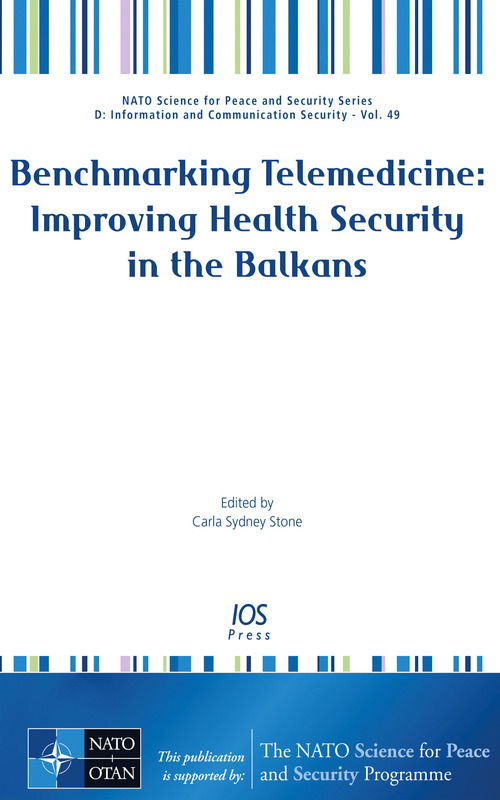 This book presents papers from the NATO Advanced Research Workshop (ARW) on Benchmarking Telemedicine: Improving Health Security in the Balkans, held in Skopje, Macedonia, in November 2016. The aim of the workshop was to bring together people from a wide range of sectors within the telemedicine community with representatives of NATO Member and Partner countries to share information and develop solutions to health security issues. Participants addressed issues such as cyber security for the implementation of telemedicine; healthcare capabilities of deployed and local medical equipment; learning methods; information sharing among local professionals; prevention and control of infectious diseases; best practices of telemedicine among NATO Member and Partner countries; integration of telemedicine across regions and borders; and telemedicine implementation. The book will be of interest to all those wishing to gain a better insight into the implications of telemedicine for health security.